This CCTV footage captures the moment a hero dog helped his shopkeeper owner fight off a knife-wielding robber – by biting him in the CROTCH. 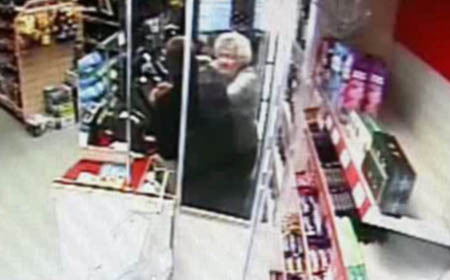 Fearless Eve Watson, 55, bravely fought back when a hooded intruder jumped over the counter brandishing a Stanley knife and demanded cash from the till. She grabbed a craft knife nearby and told him: ”So you like to play with knives do you?” before pulling down his hood to expose his face to CCTV cameras. 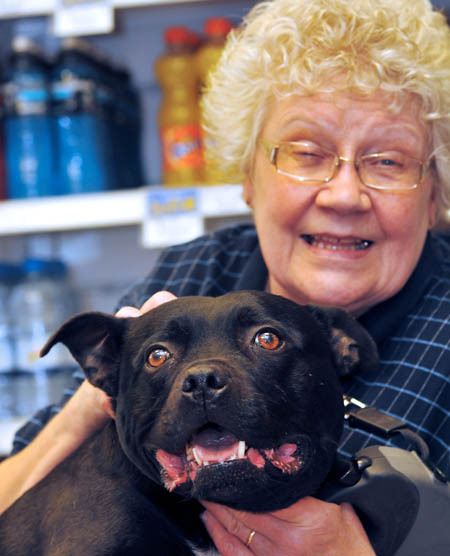 Her loyal six-year-old dog Cane then leapt to her defence by taking several bites between the man’s legs. The cowardly raider then hopped back over the counter before fleeing empty-handed. Eve, who lives above the Bargain Booze shop in Torquay, Devon, with husband Glynne, 65, said: ”There was no way I was giving in without a fight. ”I’ve worked hard for that money so why should I just give it up because some coward walks in with a knife? Eve refused to open the till before grabbing a nearby craft knife as Cane came running towards them. She added: ”I heard the commotion, walked over to the till, said to him ‘are you having a laugh?’ and then I grabbed him. ”My assistant was shouting and screaming by now, she was hysterical. ”He was holding a Stanley knife up and threatening us with it. ”That was when I saw the craft knife lying on the side. I picked it up and told him: ‘So you want to play with knives do you?’. ”We had a good old scrap and I think he cut his hand on the knife. ”He was a chancer that saw two women alone in a shop and assumed it would be easy, but I think he got more than he bargained for. ”Cane was jumping up and down and bit him at least three times in the crotch. I don’t think he drew blood but the attacker leapt over the counter and ran off. ”My husband was a bit cross with me when he found out as he said we are insured and that nothing was worth putting ourselves in danger for. Devon and Cornwall Police yesterday commended Eve for her bravery and launched an appeal to find the culprit. He is described as a white male, aged 23 to 25 with fair hair who has a thin face with an acne marked face and wearing jeans and dark trainers.